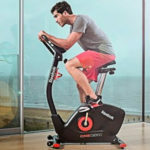 Is The Reebok Jet 100 Exercise Bike Really Able To “Do It All”? Reebok workout equipment always stands out in catalogues because the brand’s aim to blend a strong spec with a good look – and the Reebok Jet 100 Exercise Bike is no different. 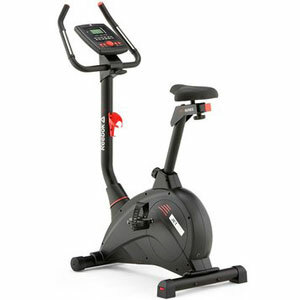 This sleek black gym bike has red accents where it counts and hides a strong 6kg flywheel. The company promise that users can “do it all” with this machine, no matter their fitness goals. The features suggest that this could be the case, but what do users really think? adjustable elements to make it more accessible. 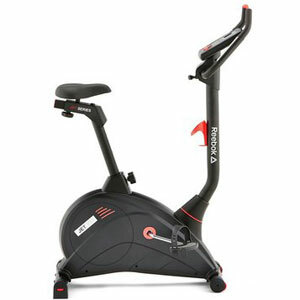 Buyers appreciate many of the features and adjustable elements to this Reebok Jet 100 Exercise Bike. The main selling point with this bike machine is arguably the range of programmes. There are 12 pre-set options here designed to take users through a series of styles and benefits. Some newcomers can work through the 16 resistance settings to test their resilience and strength. More experienced users may appreciate the chance to try the heart rate control and recovery systems. There is a clear sense with this Reebok exercise bike that the designers wanted to make this as accessible as possible. There are plenty of adjustable elements that mean that many users across the household should be able to use this. It is relative comfort despite the usual issues with the seat’s padding. This includes the adjustable handlebars and seat post. There are also self-levelling pedals with straps so users should be able to pedal with ease no matter how hard or how fast the session. The addition of the user-profiles also means that users can track their progress as they aim to meet their goals. User profiles are a nice start, but not all users are impressed with the console on this Reebok Jet100 Bike. There are some people that mention that the console on this stationary bike is a little basic and “crude”. This is a disappointment when comparing this gym bike to other Reebok products. The small display does offer the basics on time, speed and distance, as well as pulse readings via the sensors in the hand grips. Also, the controls are fairly minimal and not always that intuitive. Some buyers would also like to see a better set of instructions – for both the system within the bike and the assembly process. The learning curve isn’t too high for the programming. But, the heavy weight of the Reebok bike means that some would prefer an easier assembly process. Is this Reebok At-home Exercise Bike still recommendable after these pros and cons? There are areas where Reebok could improve this machine to make it even more user-friendly. An upgrade to the console might help those tracking their progress. A better manual would help users struggling with the heavy parts. Still, there is a lot to this bike that makes it recommendable to many users. The Reebok exercise bike is accessible, interesting and fits into the home brilliantly. Find more reviews about the Reebok Jet 100 Exercise Bike on Argos here.